Its estimated that 50,000 people sleep on the streets of L.A. every night, up 35% per cent from just last year. While in the past the figure was largely ignorable given that the homeless population was more concentrated in particular areas people steered clear of, the last three to four years have seen homeless encampments disperse across a broader portion of the city. In an effort to reduce these alarming figures which multiply faster than the city can handle, Los Angelean voters approved a bill to build out 10,000 apartment units over the next decade. Due to regulatory building codes and complex zoning rules however, the $1.2billion development of these apartments will take more time than the city has to lessen the severity of the situation. 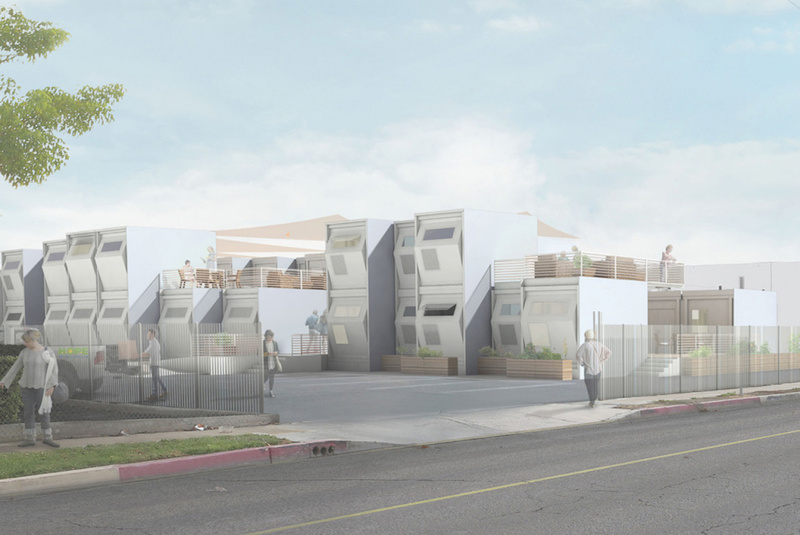 Responding to the city’s construction requirements, the Homes for Hope project is a venture comprising city planners, architects, community activists, individuals who have experienced homelessness, and non-profit veterans helping to fund the initiative, that hopes to give rise to more fruitful production results by working in accordance with L.A.’s bureaucracy instead of challenging it. 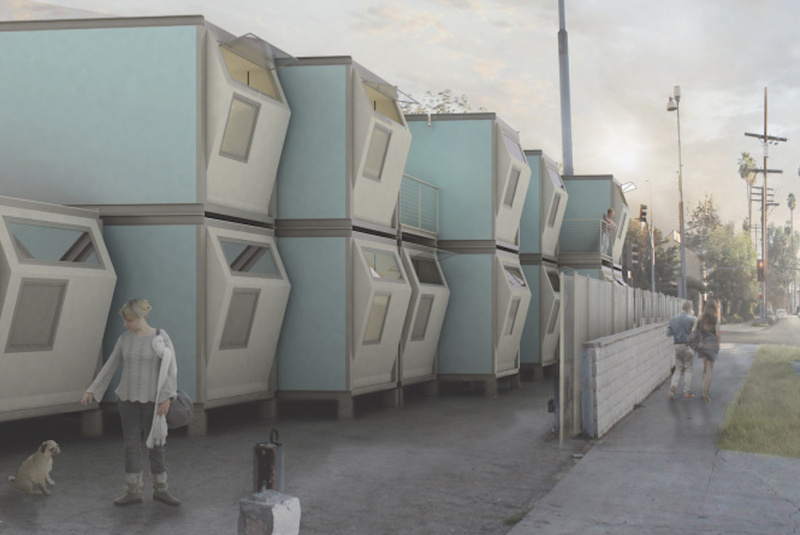 Since the start of the project, the team has prototyped a portable, single-occupant home that’s modular and designed to pull L.A.’s homeless off of the streets in as little time as possible for short-term assisted living. By offering a stepping stone to more permanent housing arrangements, Homes for Hope strategically reintegrates those without a roof over their head back into society at a lower cost to the state. 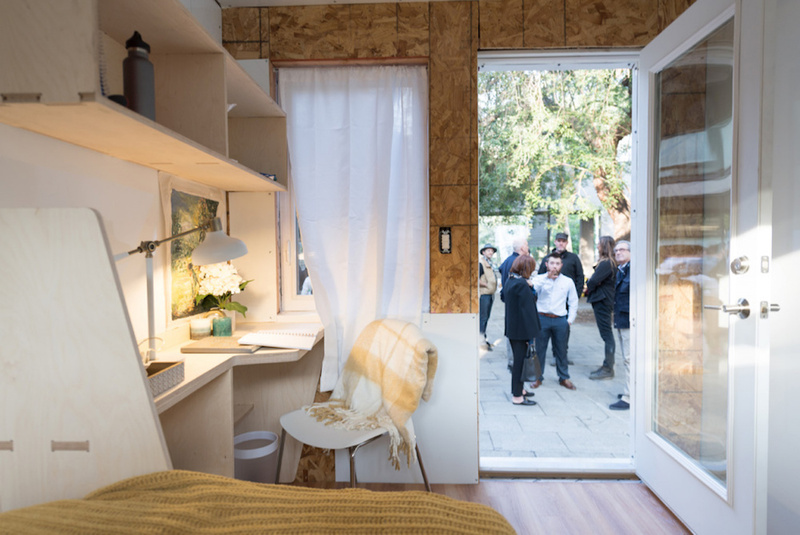 Measuring in at 92 square feet, the interior of one of these homes feels spacious nonetheless, and houses a bed, a desk, a chair and some shelves. Two windows offer an abundance of light, and are entrenched within a concave wall that extends beyond the foundation to maximize space from within. From afar, a series of these complexes certainly catches the eye, a critical element for garnering the support of local communities. 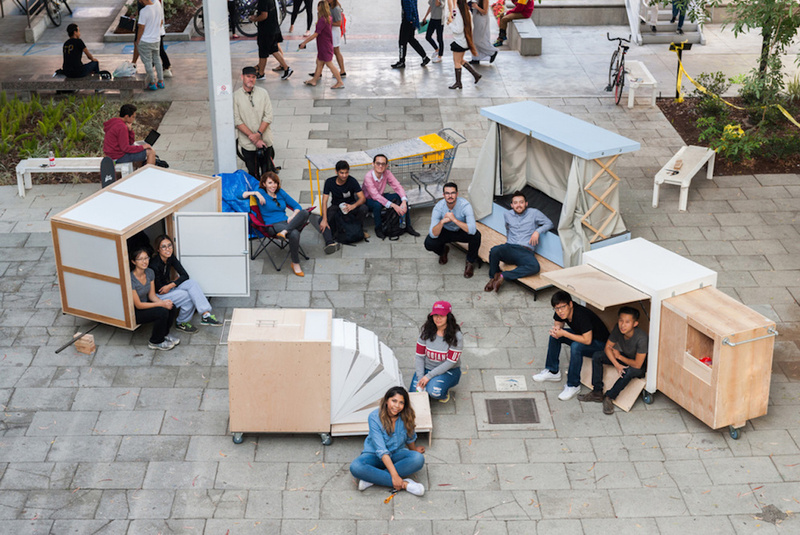 Beyond physical structures, the university students also had to design with certain city-wide building constraints. Though antiquated zoning rules still enforced today prevent much needed shelters from ever being constructed, because Homes for Hope are technically a “congregant housing” – meaning the units are manufactured offsite and are then installed temporarily – the same rules don’t apply. This detail dramatically shapes the future of the project, as it invariably opens up the possibilities for where the team can set up these communities. Moreover, by setting a cap of 30 beds at any given location, developers are able to avoid having to get a conditional permit – a process that often stalls building progress for months or years at a time. Under Ken Craft’s guidance, CEO of nonprofit Hope of the Valley, the team anticipates a smooth rollout of Homes for Hope’s initial set of temporary settlements. 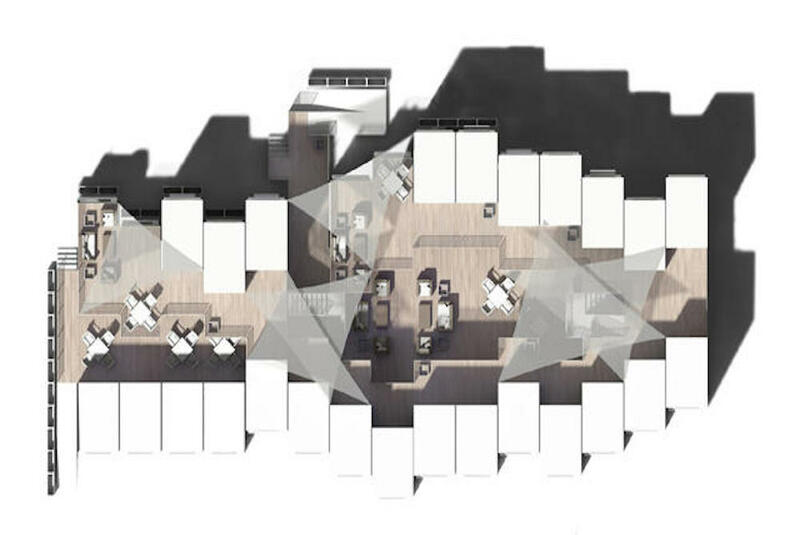 Craft’s expertise permeated into every aspect of the design process: units should be discrete, elevated so inhabitants won’t feel like they’re sleeping on the ground, offer residents the luxury of privacy, and feel modern so as to establish a sense of community. 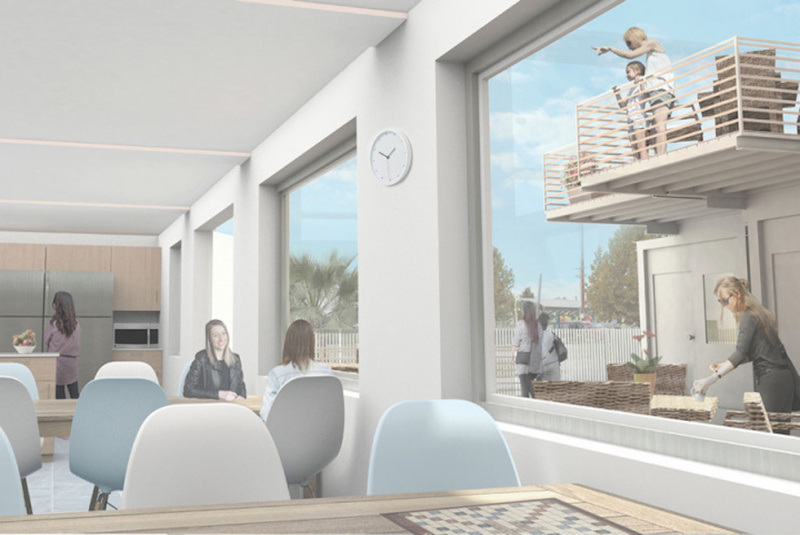 The first housing developments will target homeless women over the age of 55. At this current point in time, each pod will run supporters a combined $25,000, which takes into account the materials, furnishings, mechanical systems, and labor involved in making a unit. That said, since economies of scale bring down the cost per item when purchasing in bulk, a full 30-bed development is estimated to cost just under $1 million, an irrefutable bargain relative to the $120,000 per unit taxpayers will soon be paying California. At the total rate of $1.2billion, the state could follow this class’ protocol to build nearly four times the apartments the current bond promises. “I’m not saying this is the panacea, but this is a solution that will work and it could be implemented quickly and at much lower cost. If it is implemented on a grander scale, it could put a huge dent in reducing homelessness in Los Angeles” concludes Craft.